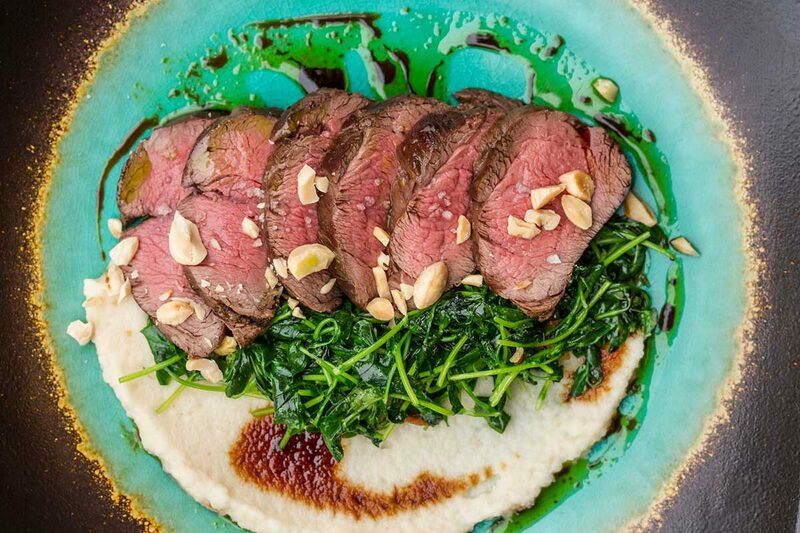 The tenderloin is a lighter flavored, exceptionally tender cut of venison – here we’ve paired it with a creamy, slightly nutty brown butter celery root puree, fruity-tangy balsamic vinegar and delicate wilted pea shoots. Trim the silverskin from the tenderloin (how to remove silver skin). Cut 6” lengths of twine and tie a series of loops around the tenderloin – about 2 inches between each loop. Pull each loop taut to compact the meat and pull all trailing pieces into the body of the tenderloin. Season it with salt & pepper. Simmer the celery root in heavily salted water until tender. Drain off the water & combine the celery root in a blender with the browned butter, chicken stock and lemon juice. Get the high heat oil hot in a large skillet over high heat. Add the tied tenderloin and sear it on all sides to an internal temperature of 125-130°F (rare-medium rare). Remove the tenderloin from the pan, cut the twine off of it, and let it rest, loosely covered with foil, on a clean plate. Get some olive oil hot in a pan over medium heat. Add the pea shoots and quickly cook them in the oil, just until wilted. 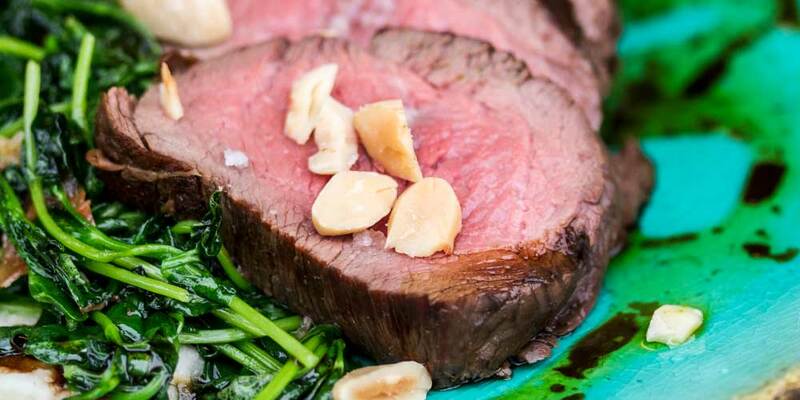 Slice the rested tenderloin into medallions, serve them atop the parsley root puree with the pea shoots, sprinkled with the marcona almonds, finished with the parsley oil and vigna oro balsamic vinegar.